A special designed vet anesthesia machine.It is a simple,safe and stable machine.It is used for animal anesthetic operation. JX7300A model is a special designed vet anesthesia machine.It is a simple,safe and stable machine.It is used for animal anesthetic operation. It is used for vet hospital,vet clinic,animal zoo, animal lab, animal unversitity, animial research institute. Bains port for open breath system, like Jackson circuit,Bains circuit. Anesthesia vaporizer: Isoflurane or Sevoflurane. supply selectatec compatiable mounting bar,ISO 23mm is compatiable. Trolley: 5 casters spider, three with brakes. 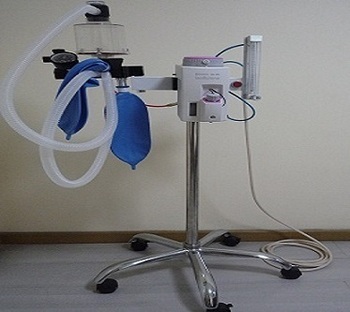 Anesthesia machine, one unit vaporizer,one unit trolley, one set consumable breath circuit, one unit reservior bag,one unit O2 gas soure pipeline. The wall mounting arm is optional.